Okay. Whoa. You know that when I start a recipe with WHOA it’ll be good! 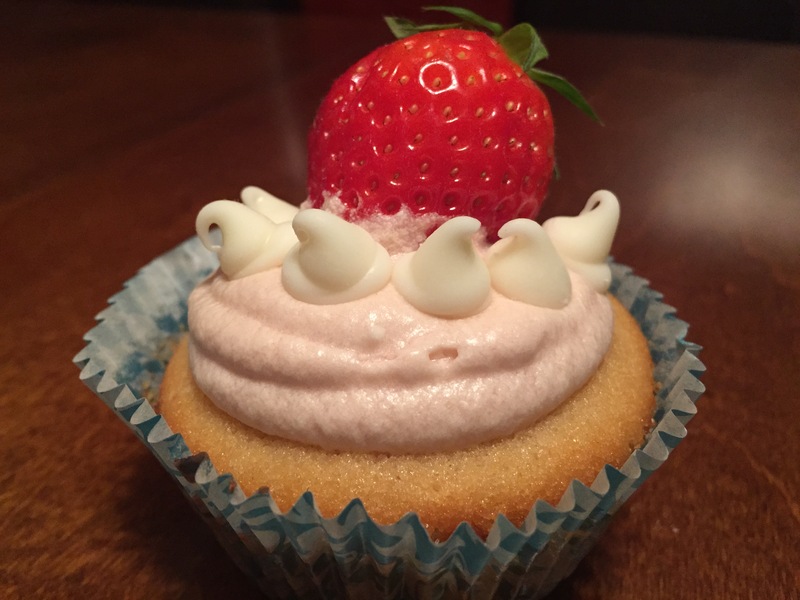 🙂 I found the original recipe for this lovely on the blog Mini Baker, but I decided to play around with it and make it gluten free and tweak a few things to make the cupcake itself a little more natural-ish. This isn’t paleo, but it’s pretty freakin’ amazing. I would highly suggest making this one ASAP. It is a great dessert and perfect for birthdays, special sweet occasions, or if you just want a mouthful of goodness! 1. Mix butter and sugar together with a hand mixer, beat at medium speed for a full 3 minutes, until the butter and sugar are very light. Beat in the extract. Whisk together the milk, oil and eggs in a medium bowl. Alternately add the milk mixture and the flour mixture, mixing thoroughly after each addition, and ending with the flour. Stir in the white chocolate morsels. Fill the cupcake liners ½ – ¾ way full. Bake for 15-19 minutes, or until the cupcakes are well risen and a toothpick inserted into the cake should come out clean. Cool in pan for 2 minutes, then transfer to a wire rack to cool completely. Cream the butter and shortening in the bowl of an electric or stand mixer. Add extracts and strawberry preserves and combine well. Add in all 4 cups of sugar, mixing thoroughly. Add 2-4 Tablespoons of heavy cream to soften the frosting. You can adjust sugar if you need – add more to make it thicker. Put frosting into a pastry bag fitted with a large circle tip, and pipe frosting onto the cooled cupcake. Add more white chocolate morsels to garnish.